Earlier this month The Who announced dates for their Moving On! 2019 North American tour and revealed they are working on a new album. For their tour, the band will play 29 dates starting on 7th May and finishing on 1st June and will include marquee venues including Fenway Park, Madison Square Garden and Hollywood Bowl. On stage, the line-up will be rounded out by familiar Who players featuring guitarist/backup singer Simon Townshend, keyboardist Loren Gold, bassist Jon Button and drummer Zak Starkey, and complemented by some of the best orchestras in the US and Canada. Later this year The Who will release their first studio album for 13 years. Pete Townshend revealed in a blog post last week that Genesis author and legendary artist, Sir Peter Blake will be creating the album's cover. The Who and Pete Townshend are documented in two Genesis signed, limited editions: Maximum Who and The Seeker Print Portfolio. 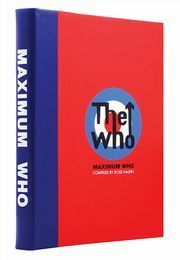 In Maximum Who, Pete Townshend, Roger Daltrey and John Entwistle re-live the creative rivalry, tense recording sessions, gigs and the multitude of other highs and lows that went hand-in-hand with being thrown into the forefront of the Sixties revolution. The Seeker Print Portfolio is a series of prints inspired by the idea of 'exploding out and imploding in': contrasting the dynamism of Townshend's live performance with moments of creative introspection. Each photograph in the Seeker Series is personally chosen and signed by Pete Townshend and spans his incredible career.